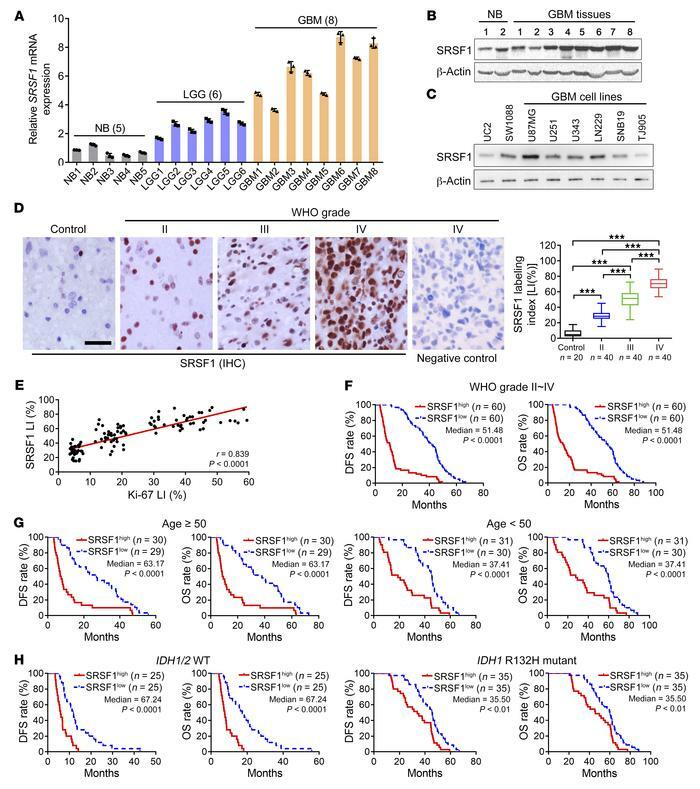 SRSF1 overexpression is correlated with excessive glioma cell proliferation and predicts poor prognoses of glioma patients. (A) Relative SRSF1 mRNA levels in glioma tissues as detected by qRT-PCR. The mean of the normal brain (NB) group was arbitrarily set to 1.0. Data are presented as mean ± SD, n = 3. (B and C) Western blot of SRSF1. The expression levels of SRSF1 were compared between GBM tissues and NBs (B), as well as among the GBM cell lines, UC2 (an immortal astrocyte cell line) and SW1088 (an anaplastic astrocytoma cell line, WHO grade III) (C). Loading control: β-actin. (D) Left: IHC staining of SRSF1 in control (nontumoral brain tissues) and glioma tissues. The negative control was established by using PBS as a substitute for the primary antibody. Scale bar: 20 μm. Right: Comparison of SRSF1 expression levels among 20 NB tissues and 120 gliomas of various grades. The expression levels are represented by labeling indexes (LIs [%]), which were calculated with Leica Image Pro Plus 5.0 software as the percentage of total cells that were positive cells. Data are presented as box plots. Boxes represent the 25th and 75th percentiles, lines represent the median, and whiskers show the minimum and maximum points. ***P < 0.001 by 1-way ANOVA with Tukey’s post test. (E) Pearson correlation analysis between the LIs of SRSF1 and Ki-67 in the glioma samples (n = 120). Pearson correlation test, r and P values are shown. (F–H) Kaplan-Meier analyses of the DFS and OS of all glioma patients (F) and patients of similar age (G) and identical IDH1/2 gene status (H). Patients were stratified into high- and low-expression groups using the medians of the SRSF1 LIs of the corresponding cohorts as cutoffs. The P values of the log-rank (Mantel-Cox) tests are presented.